0° steel-belted construction, front and rear, guarantees excellent stability at high speeds. Good control when braking for corners. Well defined and wide breakaway characteristics at maximum lean angle. 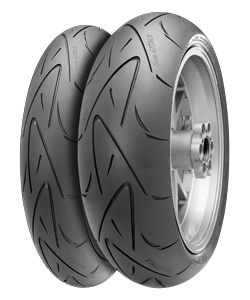 Cutting-edge design for the tread pattern, perfect for modern sports bikes. My first tyre was recalled by Continental thru Delticom Tyres for a potential sidewall fault. The cost to fit the replacement tyre was £31.50 but Delticom only refunded me £11.60. I am out of pocket by £19.90 and Delticom will not refund this amount. The tyre is great but cannot recommend Delticom Tyres.